Hello, race fans! Rev up your cropping totes and race to the finish line for this high speed, prize-filled event. Hop in the driver's seat along with your pit crew of friends and family and sport your Nascar gear. Two lucky race teams will be challenged to see just how fast they can "change the oil" Stamp & Scrapbook Expo Style. Transform your table into a Nascar Race scene. 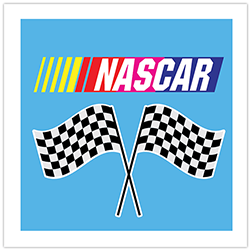 Create a great race team name and win a race cup full of prizes. By the end of the race we will crown the winning driver that will step into the winner's circle. Gas up your engines, buckle your seat belts, and put your pedal to the metal and race to this Nascar night of excitement! Each cropper who attends will have an approximate 4’ x 24” space to create, however this can vary at certain locations. Each table is set for a max seating of four people, however this can vary at certain locations. For our Marlborough & Mesa guests, you will enjoy choosing an additional FREE kit of products during the pre-registration process. For our Denver, Akron, Sacramento & Ontario guests you will no longer need to choose your kit during the pre-registration process. You will now receive a voucher redeemable at the show to choose your kit of choice. The crop area is quiet during the day. Prizes & contests will start after the show floor closes each day. During the evening hours, the crop party comes to life around the crop theme. Seating is open and on a first come first serve basis. Tables are set in groups of four, so you will make some new friends along the way. If you have a group of four and would like to reserve a table, please be sure to check out the "Table Reservation" Tab. If you have a reserved table, please notify the crop host to assist in finding your reserved table. We know how important it is for you to sit by your friends. Our crop hosts do an amazing job helping guests find seating together. If you have a party of Two, Four, Six or Eight guests and would like to reserve your seats prior to the event you are welcome to do so. Reserved seating is not necessary as all seating is on a first come first serve basis. However, this option is available to guarantee that your party will be seated together, without having to exercise our first come first serve policy. There is an additional fee to reserve your seats prior to the event. There is a $15 flat fee for Reserved Seating of 2; per day when paid online. There is a $25 flat fee for Reserved Seating of 4; per day when paid online. There is a $40 flat fee for Reserved Seating of 6; per day when paid online. There is a $50 flat fee for Reserved Seating of 8; per day when paid online. Once we receive your application, we will add the reserved seating to your order. Please allow 48-72 hours to process the application. Online seating applications close one week prior to the show. Special Requests: If you have any special requests or needs, please be sure to add this request to the seating application. Special requests or needs are filled to the best of our hosts ability and not always accommodated. Policy Changes: We understand that there may be times when you are not able to reserve seating online prior to pre-registration closing. Guests will still be able to reserve seating onsite; however, you will no longer be able to reserve seating during the evening hours with the crop host. Please see the steps below if you wish to reserve seating for a party of two, four, six or eight guests onsite. There is a $20 flat fee for Reserved Seating of 2; per day when paid onsite. There is a $30 flat fee for Reserved Seating of 4; per day when paid onsite. There is a $45 flat fee for Reserved Seating of 6; per day when paid onsite. There is a $55 flat fee for Reserved Seating of 8; per day when paid onsite. If you have a reserved table you may leave your items at your table if have already reserved for the next day. Please see your crop host prior to leaving for your reserved table card for the following day. For those guests who do not have a reserved table, but are planning to attend the crop the next day...you are more than welcome to leave your items overnight in a designated area at the crop. Unfortunately, you will not be allowed to leave your items at your table. Please inquire with your crop host. Out with old (the Tool Station was getting worn and depleted), and in with the new - Creation Station! For 20‌17, we’ve chosen the most popular types of tools and have some new tool sponsors you can try. Bring your own files to cut on the Silhouette Cameo 3. If the files are on your laptop, bring your laptop to hook it up! When attending the crop, you will need to bring supplies that will keep you busy throughout the day. Many guests will bring their rolling storage totes filled with paper, scissors, trimmer, adhesive, embellishments, albums, pens, ink, stamps…you name it! Remember, some crops are 16 hours, so bring whatever will keep you busy. We love our young scrappers! Children are welcome at our crops, however all children under 18 must be accompanied with an adult and must purchase a crop ticket for the event. Concessions will be available throughout the day and into the evening at each of our show locations. Times vary during the evening hours. Your Crop Host will notify attendees when concessions are about to close, so you can be sure to stock up on any last minute drinks or snacks. Please note that the facility does not allow outside food. Concealed snack food is okay, but please no rolling coolers. Pizza delivery is also discouraged. Want to operate your die cut machines, photo printers, lights and laptop computers? We can arrange for the Venue Electrician to run power to your crop table. (Price varies per location.) You must first pre-register online for your crop tickets and then contact us by phone (888) 252-EXPO or email info@scrapbookexpo.com to have Venue Power added to your order. You will be provided with a Power Strip to plug your devices into. Please note that Battery Packs are not allowed. Also note Wall Outlets are not available for public use. There will be a Cell Phone Charging Area for your convenience. If you have any questions about Electricity don't hesitate to contact our office or speak with the staff at the show.